Misshaped teeth can give your entire smile an odd, uneven look. If one of your teeth is considerably larger or smaller than all the rest, or is shaped in such a way that it creates gaps between your teeth, your remaining teeth can drift out of their proper position, causing all sorts of issues. Regardless of the cause or location of your misshaped teeth, you are probably quite self-conscious about how they look, and are on the hunt for a treatment that will give you a balanced, even smile and greater self-confidence. Composite Bonding: a simple, quick treatment, composite bonding involves the application of a form of plastic to the surface of your teeth to repair chips, strengthen worn surfaces and improve the overall shape of your teeth. Porcelain Veneers: fine tooth-shaped pieces of porcelain, veneers are fixed to the front surfaces of your teeth to create a gorgeous, flawless smile. 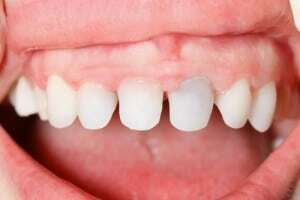 Composite Veneers: similar to their porcelain counterpart, composite veneers are fixed to the surface of your teeth. The difference is that they are made from a composite resin. Porcelain Crowns: sometimes called caps, porcelain crowns are placed over the top of your natural teeth, and are designed to strengthen the visible part of your tooth.We also provide treatment that includes full crowns, veneered and indirect restoration. Enhancement of your smile, giving you more self-confidence. Preventing your teeth from drifting into any gaps. Preventing premature damage to opposing and adjacent teeth. Reducing the risk of infection and gum disease.